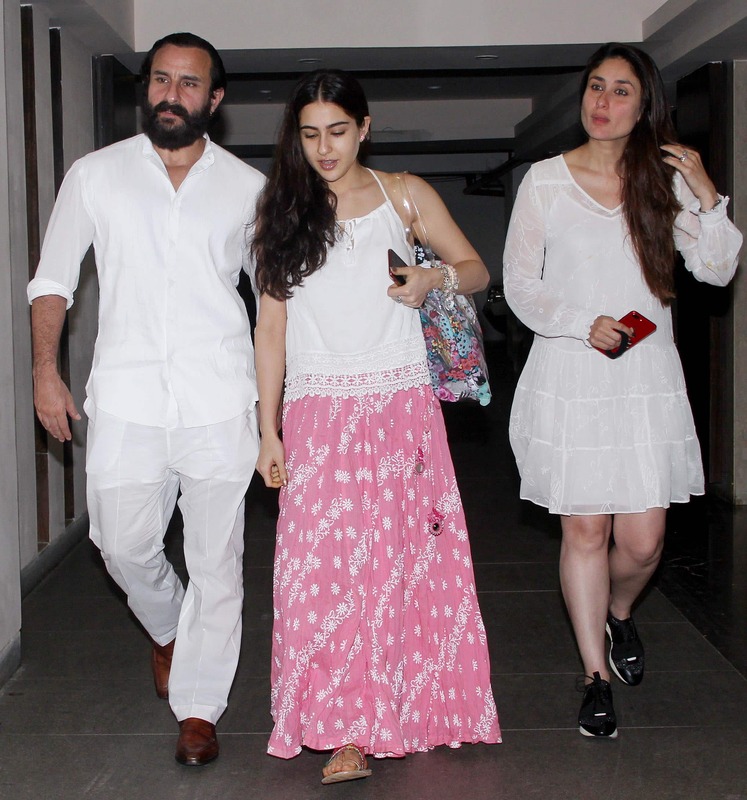 Sara Ali Khan was spotted spending a quality time with father Saif Ali Khan and stepmother Kareena Kapoor Khan. All three of them were nicely colour-coordinated in white as they exited Soha Ali Khan and Kunal Khemu's residence. Although the most good looking family shared a frame, the absence of the star of the family Taimur Ali Khan was deeply felt. We would have loved to see a picture of Saif's gorgeous daughter and his delectable son Taimur. Sara, who is all set to become Bollywood's one of the most ravishing actresses, looked every bit elegant and regal in a white and pink dress. 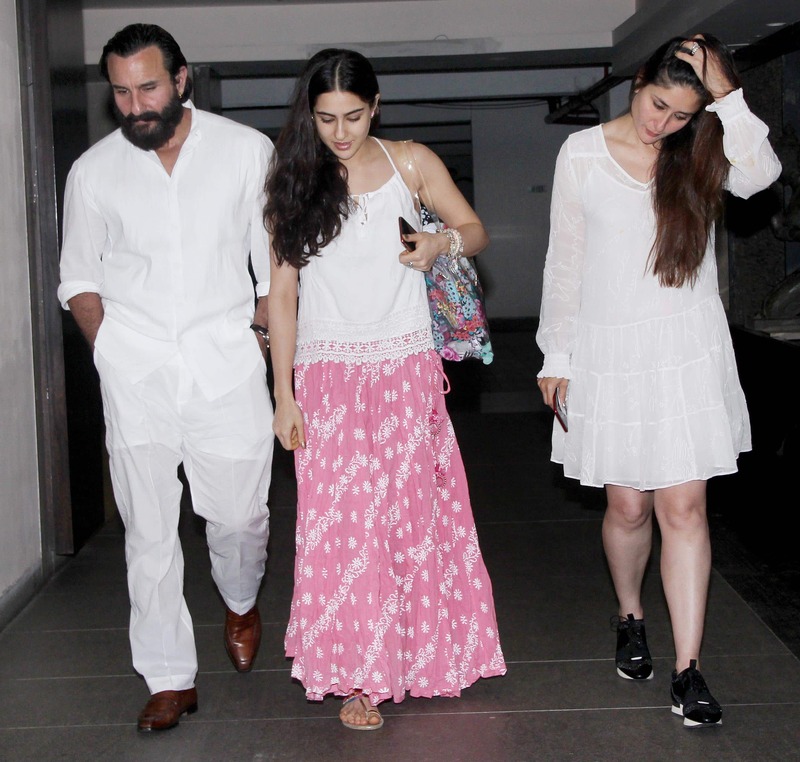 Kareena Kapoor looked her casual dress in a white frock and black sneakers while Saif, as usual, aced his nawab look. Recently rumours were rife that Saif Ali Khan and Sara Ali Khan will star in a film together post her debut film 'Kedarnath'. As per a DNA report, the actor has given his nod to a film by director Nitin Kakkar.Saif told DNA, “Nitin and I have been in talks for a film, but it’s in the early stages. We haven’t finalised it yet. The script is good The report further reveals that the movie will be based on a father-daughter relationship. A source told DNA that the movie is a comical but poignant take on a father-daughter relationship and the equation the two share. The film will also have a message. Sara Ali Khan is Saif's elder daughter with his first wife and veteran actress Amrita Singh. Sara will also be seen opposite Ranveer Singh in 'Simmba'.